The car flies along the Mysore road. My cousin Bala is driving and the roads are delightfully empty as it is a Sunday morning. We are headed for the Lambani tribal settlement on the outskirts on the city. This tribe makes beautiful metal jewelry and embroidered cloth with mirror work, well known for their excellent craftsmanship. We are hoping to see the making of the lovely artefacts and to buy some, if available. From the highway we turn onto a paved road; just barely paved. Soon the going gets worse as the paving disappears from under the wheels and the terrain gets increasingly tough. Soon the path becomes two ruts hardly visible among the high grass, climbing up and down hillocks. The vehicle is lurching from side to side, the bottom often touching the ground with scraping noises. I’m getting more and more uneasy, as I’m the instigator of the plan. The other occupants of the car – Min and Bala’s wife Su – have this scared look on their faces and are looking uneasily around. Soon the trees on either side are brushing the car and we can hear scratchy scrapy noises. Any indication of a road or path is almost gone. There is all kinds of discussion in the car… what if we get stuck somewhere, how will we turn the car around, what if we are not welcome where we are going… Su and I try to dissuade Bala from going any further. And Min looks like she is ready to scream at the first indication of trouble. But apparently Bala is looking for adventure. We have come this far; now we don’t want to turn back without seeing the village… the road is sure to get better further along, says Bala the eternal optimist. Aah… I guess my imagination ran away with me… The story up to the point where we burst into the clearing is all true. We find ourselves in a grove of young mango trees, with some construction happening at one end of the grove. We speak to the people there… yes, we are on the right track; the Lambanis live around the area. No, they do not carry on their traditional arts anymore, at least not around there. And at this time, mid-morning, most of them will be at their work places. 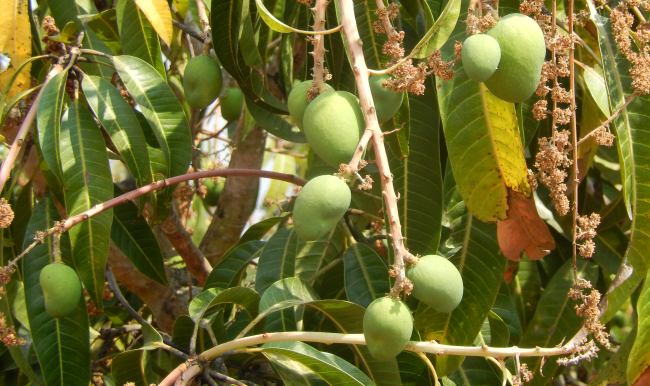 Young mangoes – mouthwatering stuff! So, a wild goose chase, but we thoroughly enjoyed it! 🙂 And the day provided many other enjoyments as well. On the way where we stopped for breakfast, we got to taste moode idli, a delicacy of the locale. 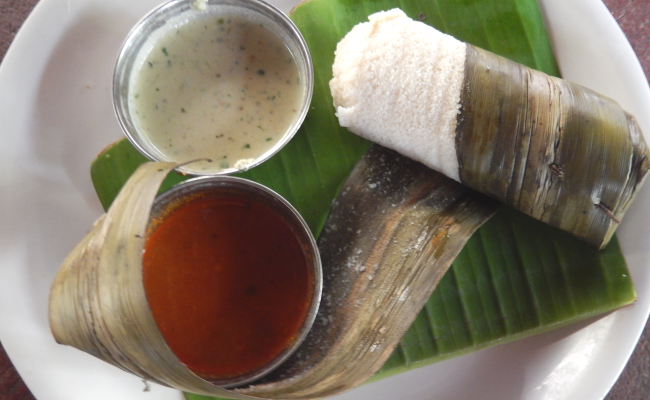 Made of a mix of rice and lentils, it is steamed wrapped in pandanus leaves. 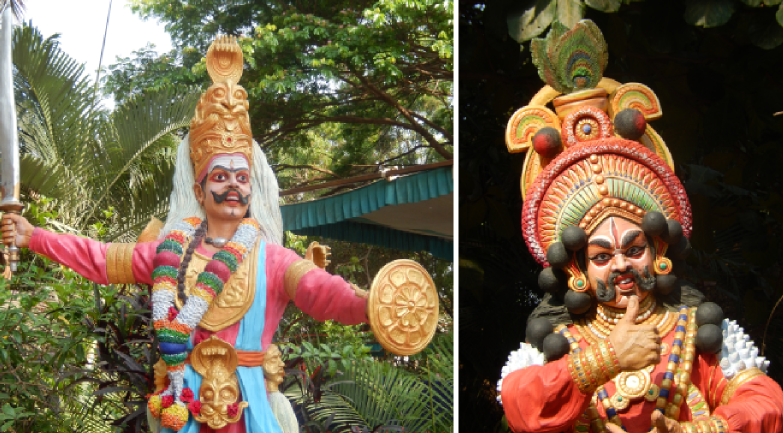 Also, we stopped at Janapada Loka, a cultural center set up to nourish the arts and crafts of Karnataka. Founded in 1994, it is located on the Bangalore-Mysore Road on a 15-acre campus. 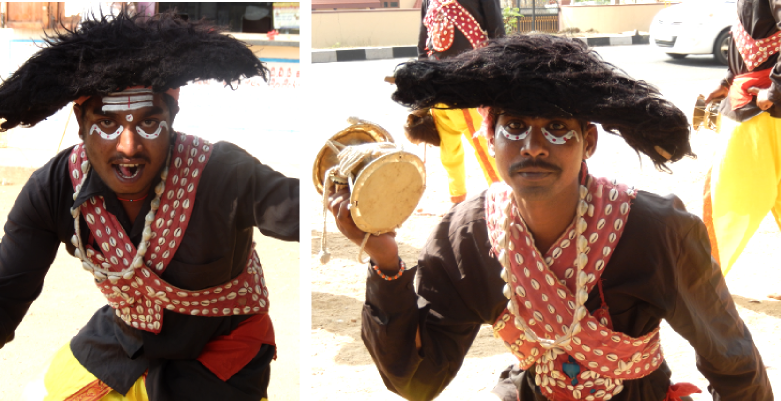 Artists in residence perform and conduct training in the traditional dance forms and music. 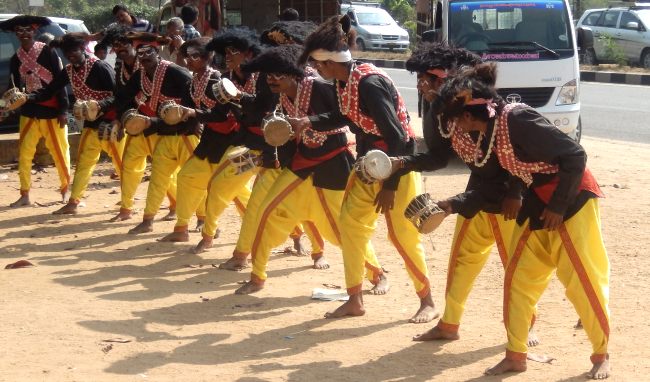 Bangalore University has recognised Janapada Loka as a research centre. With sincere apologies to the Lambani people. The above story is no indication of the behaviour of the friendly and peaceful tribes; it only proves the influence of popular fiction on my imagination.